All boys must keep their hair short (not being more than 2 inches long).Boys will not be permitted to sport trendy hairstyles.Exceptions on religious grounds will be made.The school will use the on call barber to have the hair cut with no parental consent. Muslim Girls are allowed to wear a Hijab which is Black in colour. Long nails and nail polish is prohibited. Girls upto grade 8 with long hair should tie their hair into 2 plaits along with a black hair band. Girls of grade 9 above are permitted to wear their hair in a single plait or pony tail, tied back with black bands only. Fringe will need to neatly clipped. Senior boys need to have a neat shaven look. One extra set of clothes and undergarments should be sent with the student by the first week of school in a labelled bag for all children up to Grade 1 -3. Students are permitted to wear watches only from grade 5 upwards. An oversized t-shirt tagged with the student’s name has to be sent for art and pottery for all students. Students of grades 1-12 should wear the sports uniform on Wednesdays. Students are expected to wear their neckties on Mondays and on special events. Students come in regular school uniform on the day school reopens at the beginning of an academic session, even if this falls on a Wednesday. 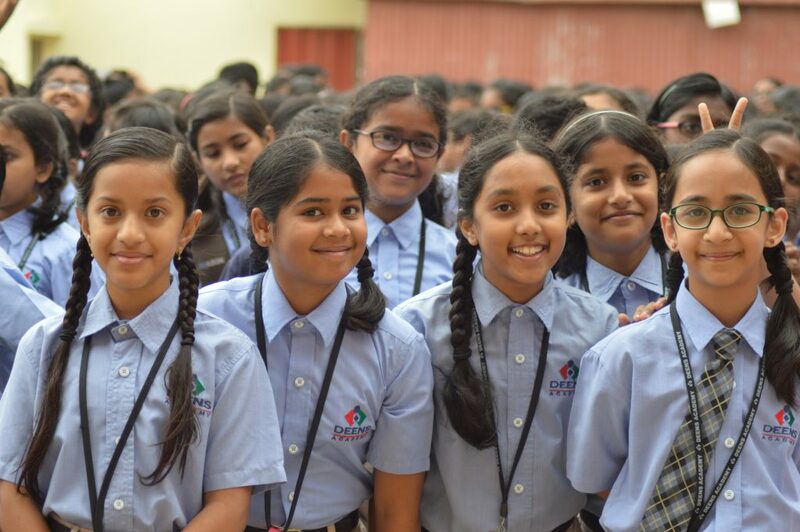 Students are expected to wear the caps and sweaters as per the school uniform code only. Sweatshirts are permitted only if the weather is below 24 degrees. Sweatshirts are not permitted in warm weather and they may not be allowed to hang around the hips. Children will wear only school shorts for all sport-related activities. All Uniform requirements are available at the ‘Proshop’ operated by our vendor YOUNIFORM. After the initial sale is completed Pro-Shop accepts order through their Online Portal or you also order via email sachin.youniform@gmail.com or you may contact the customer care on : Mr Venu: venu@yfm.co.in. , 7795648490,Mr. Ganesh :09582210951.